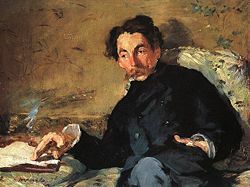 Portrait of Stéphane Mallarmé by Édouard Manet. Stéphane Mallarmé (March 18, 1842 – September 9, 1898), whose real name was Étienne Mallarmé, was a French poet who, along with Paul Verlaine, was one of the founders of the Symbolist movement in French poetry. Symbolism became one of the dominant poetic movements not only for French literature in the nineteenth century, but for English, American and Russian poets who would adopt the conventions of Symbolism into the emergent twentieth-century forms of Modernism. As a Symbolist, Mallarmé is following in the long tradition of poetic allegory. What sets him apart from generations of poets, and distinguishes him as Symbolist, is the sheer density of images and allegories that he utilizes, which moves the symbol into the forefront of poetic achievement and reduces emphasis on narrative logic and traditional poetic form and structure. Mallarmé's poetry, like Charles Baudelaire, uses central images such as a star, the sky, a virgin or similar metaphors referring to them again and again through the course of a poem, using the image to symbolize an abstract aspect of the human mind. This tendency to abstraction, a common element in Symbolist poetry, can make it difficult to translate, Mallarmé's poetry notoriously so, although it is also considered difficult in the original as well. More than a century after his death, he is still considered to be one of the most difficult and intimidating poets in the French language. Each of his poems is layered with allusions, word-play, and metaphors, and often the sounds of the words are just as important as their literal meanings. While a challenge to the reader, this feature made Mallarmé particularly appealing to musicians—and more than a little music, including a famous piece by Claude Debussy, has been inspired by his works. Part of the challenge of Mallarmé's work is based on his complicated theories of poetry. Mallarmé believed that, beneath the surface of appearances, reality consisted of nothing but darkness and emptiness. He believed that poetry and art, however, could candle the darkness and bring out, however faintly and however briefly, the light of creativity and thought. This confusing and rather contradictory theory was not without its detractors; the painter Edgar Degas famously stormed out of a lecture where Mallarmé was trying to explain his ideas shouting "I do not understand! I do not understand!" Nevertheless, it is with this paradoxical view of the world that Mallarmé developed poetry for a paradoxical world; although he never lived to complete his masterpiece, his ideas, and the radical changes to poetic style which he introduced, would alter the face of nineteenth and twentieth century literature forever. The young Mallarmé was born in Paris to a middle-class family that had maintained a long and distinguished tradition of public service; both Mallarme's grandfathers and his father had careers as civil servants. Mallarmé was expected to follow in this tradition. To this end he was enrolled in a prestigious private school, but he did not do well in his classes; his only good grades were in foreign languages. The young Mallarmé was described by his friends and family as a somber and moody child. It is clear from Mallarmé's own writings; especially his dark, early poems that he lived a deeply unhappy childhood. He suffered greatly from the early death of his mother in 1847, when he was only five, as well as from the death of his sister in 1857. Mallarmé's juvenile poems, written after he discovered Victor Hugo and Charles Baudelaire, echo a sense of Romantic longing for an ideal world away from grim reality that would prove to be an enduring theme in his mature poetry, even as he would continue to evolve and become increasingly intellectual and philosophical. Much of Mallarmé's adult life was, sadly, no less miserable for him than his early years. Considered somewhat of a failure by his family, he moved to London in 1863 in order to perfect his English. While there, he married an Englishwoman, and returned with her to France where he took up a post in the provinces as an English teacher, a career to which he was to devote thirty years of his life. Unfortunately, Mallarmé was not a very gifted teacher. He found the work itself frustrating and uncongenial. The poor pay he received only became more troubling after the birth of his children, Genevieve (in 1864) and Anatole (in 1871). By 1868 Mallarmé had formulated his theory of poetry. The purpose of the poet, according to Mallarmé, was to somehow create something out of the nothingness that is the world and to bring into being, in his own phrase, l'absente de tous bouquets, the ideal flower absent from the bouquet. From 1868 on, Mallarmé devoted all of his energies to bringing this absent ideal into being. He intended to produce an epic work that would illustrate his ideas, which he called his Grand Oeuvre (Great Work) or Le Livre (The Book), though he never finished it nor, as far as scholars can tell, ever really began work on it at all. Whatever Mallarmé may have planned for this great work is largely open to conjecture; barely any fragments of the planned work exist, and the few notes that have survived from Mallarmé's notebooks reveal very little of what it may have looked like had it been completed. It has been conjectured that the reason Mallarmé never finished the Grand Oeuvre is because, late in life, he ultimately turned away from the intense and philosophical views which had dominated most of his career. Certainly, by the 1890s, at a relatively advanced age for a poet, Mallarmé had finally gained the recongition he deserved. Glowing reviews by his friend Paul Verlaine and the praise lavished on him by Joris-Karl Huysmans in his novel À rebours resulted in Mallarmé becoming a literary celebrity in Paris. Painters, poets, writers and patrons flocked to his home, where he would hold weekly salons and discuss his ideas on art. Many of the greatest artistic minds in Europe would attend these salons, among them Marcel Proust, W.B. Yeats, Paul Verlaine, and Ranier Marie Rilke. The poems Mallarmé wrote during this period of final success expressed a view of reality that was increasingly content with the world as it is; a series of sonnets written to his mistress, and most especially the poem Un Coup de dés ("A Throw of the Dice"), written the year before he died and considered one of his finest, express this feeling of contentment. Mallarmé's conclusion is that, despite the presence of doubt, despite the daunting "void" of reality, "all thought emits a throw of the dice" —and hence, all thought runs the risk of hazard but, as Mallarmé triumphantly concludes, all thought can succeed. from this conflagration             at his feet. This page was last modified on 11 September 2014, at 16:02.